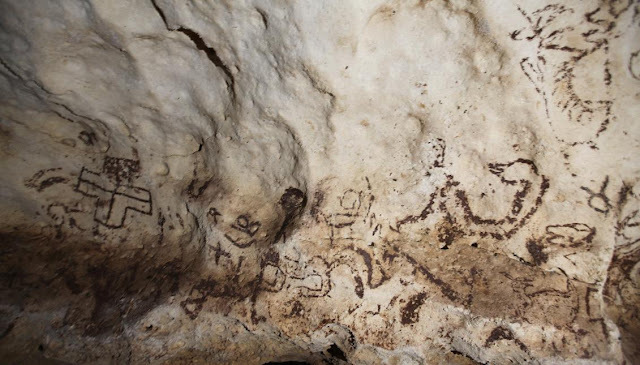 Deep in the jungle, archaeologist Sergio Grosjean Abimerhi and his team discovered what could be the most important Mayan cave paintings on the Yucatan Peninsula. The paintings cover a rock approximately 15 meters (49 feet) long and 5 meters high inside a cave in eastern Yucatan state, which also holds a small sinkhole of blue water. “These are not the only cave paintings in the Yucatan, but they’re the most important because they have so many elements: birds, mammals, a cross, geometric figures, human forms including a warrior, as well as hands both negative and positive,” Grosjean, head of the Mexican Institute of Ecology, Science and Culture, told EFE. He said they have contacted researchers at the National Anthropology and History Institute (INAH) and other specialists with whom they will meet in the coming days at the site in order to identify the elements. “Right now we’re unable to reveal the exact location, because unfortunately in the Yucatan, the looters and vandals are always a step ahead of us,” he said. “Culturally speaking the Yucatan is full of riches, but unfortunately there’s no interest at the three levels of government (federal, state and municipal). They don’t value or respect the sacred Mayan sites, in fact some have been turned into beach resorts,” the diver said. Disgusting how the government treats these sites of such archaeological importance like trash. Desecrating their own heritage is the equivalent to them dancing on their ancestors graves and then building a five star resort on top of it. We.know a guide that specializes in caves and takes us through the jungle, some caves are in land own by locals. We've seen caves that are used to shelter cows with walls carved by the Maya art, engravings and paintings. México is a treasure, but there is not enough money to explore it. The INAH, Mexican Institute of Archaeology and history, receives reports and maps every day of new archaeological finds, pyramids, temples, caves. We need more help from the archaeologists of the world. We need a World Archaeological Society Task to enforce the protection and research of the most important treasure of humankind, our past.